What a fabulous tutorial, Pam. Thank you! I'm going to incorporate this into the next shirt I make for DH. Very thorough and clear, Pam. I am going to try this, too. Thanks for another great tutorial Pam - you are an excellent and generous teacher. I don't make shirts for my husband but all your tips can be applied to those I make for myself and my grandson. 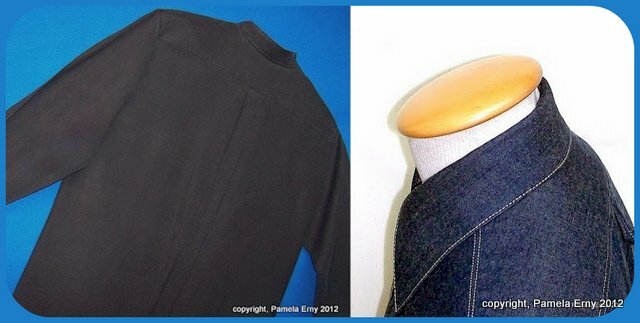 Pam, I always enjoy your tutorials but what amazes me is the perfect top-stitching you your shirts - i.e. the blue one shown at the top of the post. How do you do that?!! My straight lines always wiggle. Thank you Pam. You are such a generous blogger. Very interesting - I love yout tutorials - thanks! Perfect timing since I'm going to start a new shirt for my husband this weekend, and since it's going to be white (! ), I need something new to keep me interested. I'm looking forward to trying this out. Thanks, Pam! Thanks for the post - I am just starting to draft a shirt for DH, and this will come in handy. 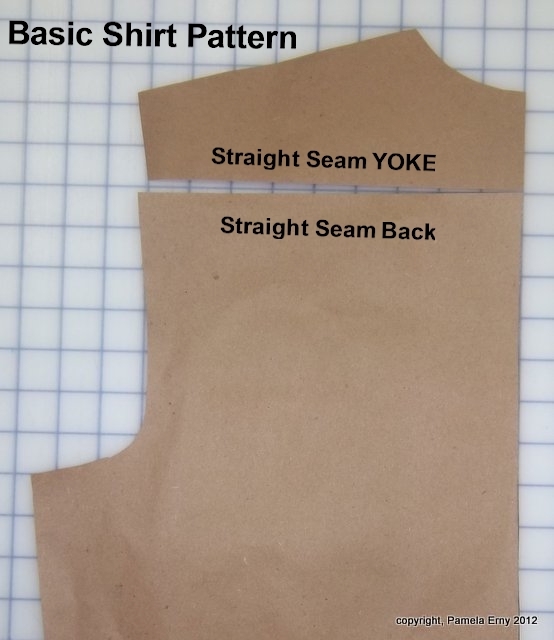 I am a bit confused on the sleeve adjustment, though - if you aren't slashing the pattern all the way to the lower edge (but are stopping 3" or so from it), won't there be a bubble/wrinkle in it once it's taped at the top? Thank-you all very much for your comments. Hello Christine...please see the revised version of the tutorial..specifically about the sleeve change. To answer your specific question...the overlap is so small that if there is a "bubble", it will be miniscule and can be ignored. 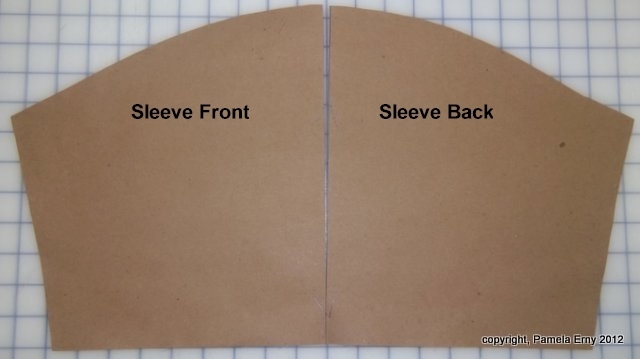 You can see that there is no change to the the sleeve shape at the hem/cuff edge, and there is no bubble on the sleeve pattern piece I have shown, and it was made from very heavy brown paper. If a bubble does form, slice the line further and fold it out by pinching the "sliced line" where the excess may form. However, since you are drafting your own shirt, You do not have to make any changes to an existing pattern, which is what I am showing here...and can just draft a sleeve to fit the armscye when you get to that point. If you are changing the yoke and back of an hand-draft you have previously done, you can draft a new sleeve to fit the armscye. Hi Claire, A classic Man's shirt is drafted without shoulder darts. And just personally, I would *only* put them there if I wanted to make a design "statement". 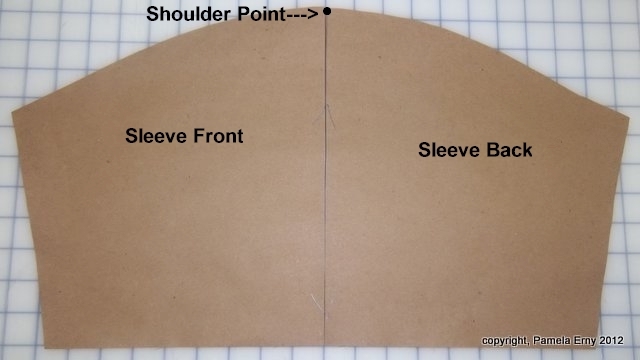 If you do rotate the dart to that area of the pattern piece...after those darts are sewn, the front parts of the shirt that join the yoke would then be longer..and have to be gathered, pleated, etc to match. Thank you so much for your tutorial. Please continue to write more as they are very much appreciated as well as needed! I really enjoy your tutorials and aspire to create a great shirt for my husband using your techniques. Thank you for the time and effort you put into them. I love your tutorials and really appreciate you sharing your expertise. They are clear and seem do-able for the basic home sewer. I love how much better vintage patterns look and fit and wish the pattern companies would just go back to what they used to do, but until then.... I vote keep them coming! Thanks so much. Pam, just left a comment on Ann's blog about your blog. Love, Love, Love that you take so much time to give us great tuts. As mentioned in that comment, I think I have all of your tutorials printed out and in my sewing techniques binder. I appreciate all your hard work and that you are always so kind enough to share with us. I have learned so much from you. I'll try to leave my comments more often and try not to be in such a hurry. Thank you so much! I'm serious when I say I'd love to buy a book of yours should you write one! I am still very beginner, but I have always appreciated your tutorials, Pam! 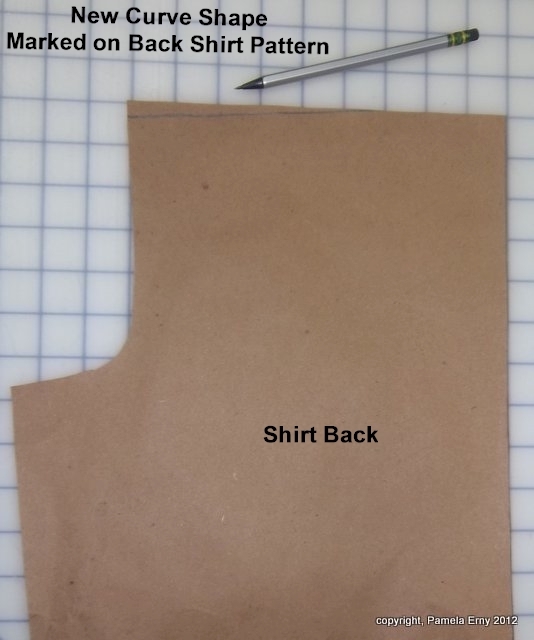 It is rare for very experienced sewers to take the time to post detailed tutorials on the Internet, particularly in a specialty, like shirtmaking. (Understandably so, given the effort!) Over time, I know I will be referring to your tutorials more and more, as my skills improve. Thank you so much for sharing your wisdom and knowledge with us, Pam! What a fabulous blog!! Thank you so much for all of your hard work and terrific tutorials. Thank you for a great tutorial Pam! Thank you for this tutorial. I am pinning this on Pinterest so I will be able to find it when I make a shirt! Thanks so much! I hope you do more, I read your blog every day and have learned a lot from you. Thanks for the tutorial - I have some shirts to make in the near future, this will come in handy! Excellent tutorial, Pam. I'm bookmarking it. Love your tutorials! Keep them coming. 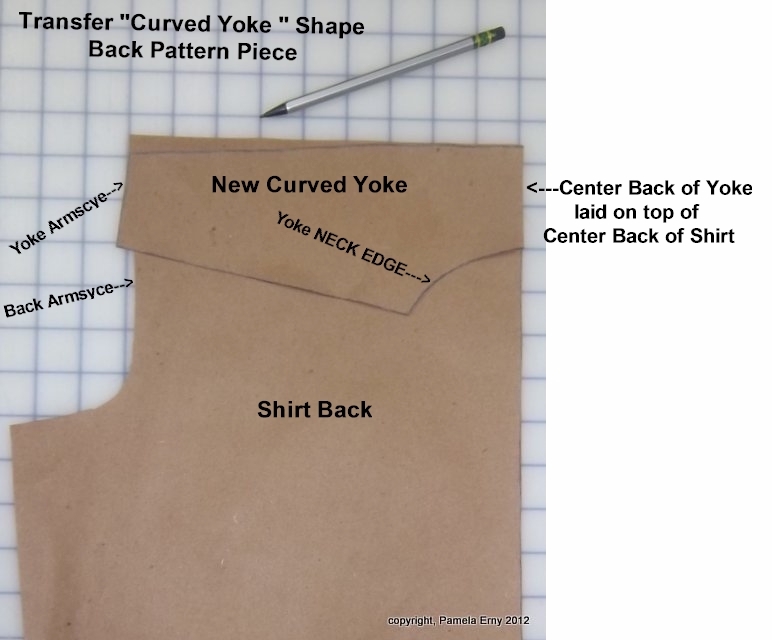 Pam, we are all making shirts over at Stitcher's Guild and your tutorials are often referenced so yes we want more. 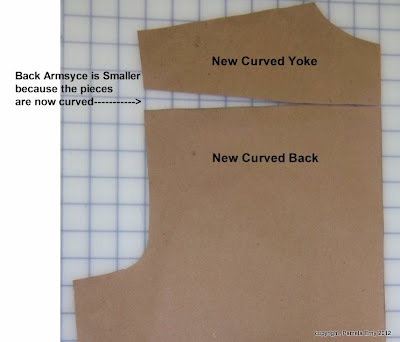 I've got a McCall's TNT pattern, yokeless, that I'm going to be adapting for a yoke. I will be referencing this tutorial, so thank you very much. Thank you for the concise tutorial! I hope to see more. As others have mentioned here, I, too, would buy a book written by you. Love your tutorials. Please continue - I learn so much. Thanks a million!! Terrific tutorial. I am having trouble see how this impacts the shirt, but I will just have to play a bit. I appreciate all the time and effort you put into writing these tutorials. I always learn something from them! Thank you for sharing your knowledge with the rest of us. I love the tutorials and very much appreciate your time and effort. This is another fantastic one. I love, love, love your tutorials! You make things seem so simple. Please continue. Pam, I always enjoy your clear and thorough tutorials! 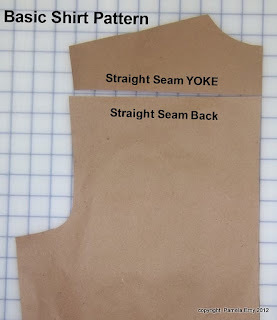 This one on the yoke change is especially helpful. Just what I have been looking for! I am not leaving comments very often (because I need some time to write my own blog after reading all those other interesting blogs... ;-) ) but please don't stop your tutorials! They are such a valuable source of information and there is not so much about menswear around. So please keep up with your tutorials, they are excellent! Pam- thanks for another wonderful tutorial. Like some of the others who have commented, I consult your tutorials frequently and I don't comment enough. Thank you for the reminder on Ann's blog. I appreciate the quality tutorials that you produce and realize that it takes much time and effort. Thanks again for putting these together. A book is a lot of work, but I'd be first in line to buy yours! 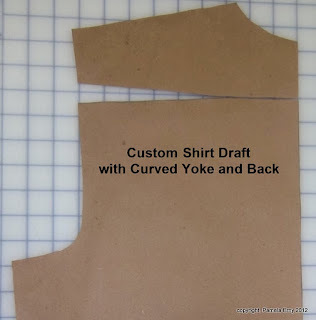 I think I may have a play around on half-scale sometime (as per your suggestion) as I'm keen to try making my husband a shirt (a casual one first) and he has a rounded upper back - so in my beginner's mind's-eye I think playing with the yoke would yield him benefits in terms of fit. Pam, this tutorial is wonderful. I read it the other day and bookmarked it because I plan to use the guidance you provided - with wonderful photos and clear description - but also because you so kindly listed your other tips and tutorials! At the time I did that, I didn't comment; only after reading your comment on Gorgeous Things' blog did I think to come back and express my appreciation. 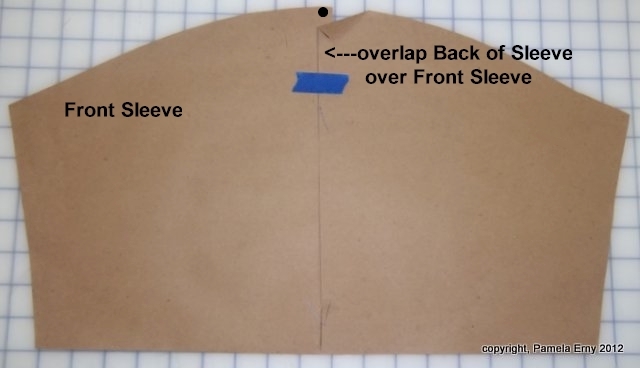 (I had already remarked to a couple of friends how generous it is of you and other sewists to take the time to compose a tutorial, take photos, arrange them with comments in logical, clear order, and then even to go back and revise them after getting questions! So now I'll join in with the many others who did comment immediately, and hope you read comments posted belatedly. ) Thank you so very, very much for sharing your expertise with us. And please continue. You are so generous in making these tutorials. they make me a bit less scared of Shirtmaking. Thank you. I finally had time to catch up on your blog and the tutorials that must take a huge chunk of time to do. After a lengthy sewing hiatus, I'm finally ready to jump back into shirt construction - and I blame you. ;-) My go-to patterns could definitely benefit from your refinements. Thank you for sharing your secrets.